Coupon Spice was given the opportunity to Review Wolf Brand Chili! Check out her Review Here. I have teamed up with her and some other amazing bloggers to bring you this Wolf Brand Chili Giveaway, sponsored by Wolf Brand Chili! 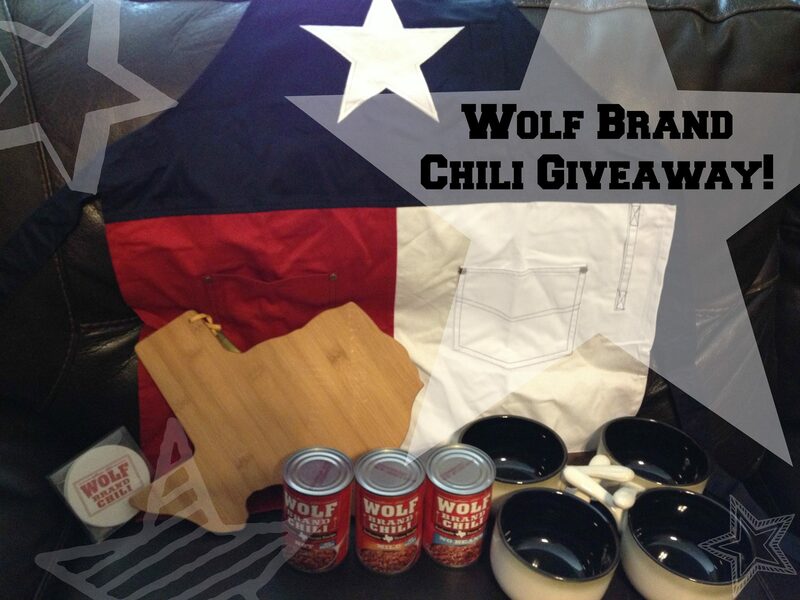 The winner will receive everything pictured above which includes Texas-shaped cutting board, Texas apron, Soup Bowls and Coasters in addition to the chili of course! Enter via the Rafflecopter below and GOOD LUCK! I love how tasty it is! I have never tried it,but would love to. I don’t think I have ever tried this brand of chili. The convenience of it would be great. My fave thing is the great taste. Honestly, what’s not to love? We have a lot of that here. Aside from Hormel, that’s all I will eat. I like the bold flavor! I like homemade taste and the convenience of it being out of the can. I love how easy it is to serve! I haven’t tried this but we are big chili fans! I like the flavor of their sauce. The best thing would be trying it cause where I live, there is no Wolf Chili. My family likes the taste of wolf brand chili so when I’m short on time and can’t make my own chili I know I’m still offering them something they enjoy. The thickness and bold flavor and its easy to make quickly! My family and I love chili, but until Wolf Brand Chili came out, I always had to make it from scratch. I have been so thankful for being able to have a quick and delicious hot meal ready for my family without cooking for hours. Wolf Brand Chili truly does taste like homemade. It’s quick and easy to make! I like that it tastes like it was homemade. There is nothing better than the first bowl of chili for the year after the cool weather starts. I haven’t tried it yet. But it looks great. We always have several cans of Wolf Brand Chili (no beans) in the pantry. It is erfect for that really quick dinner or football lunch. We usually have it with brats and mac and cheese. I love texas and this chili! I have never tried it. But I would like to. I have not tried it but it sure looks yummy! would love to try it! I’ve never tried it. I don’t think they carry it here. I have never tried it. I am not sure if it is available here. I love that it tastes good on hot dogs! Also I love making frito pie with it. It reminds me of my childhood, this was the only canned chili that I liked! I have never tried this brand before, but I love spicy chili. Haven’t tried it…but we love hot spicy chili! i haven’t tried it yet, but after reading your review, i will, sounds delicious, thank you! It is remarkably versatile. I’ve used it a half a dozen ways. My favorite thing about it is that it tastes better than most canned chili. It’s really hard to find good chili in a can. Thank you. I haven’t tried it yet. I do like a hot, spicy chili. Taste like Homemade without all the work! I love that it tastes authentic. It doesn’t taste like canned chili. It tastes like homemade chili. I like that they have chili with no beans. Looks yummy! I haven’t had it before, but can’t wait to try it. I’ve never tried it, but would love to. I haven’t tried it yet, but looking forward to it. I top it with some cheddar cheese and the taste is the best. I have never tried it, but I would love to. We like the taste and the price. I’ve actually never had it, but it sounds good and we eat a lot of chili around here! I have never tried it but my husband would be happy to hear there is a no beans variety. I just tried it for the first time a few weeks ago and love the way it tastes!! The taste! All the taste of homemade without all the work! I like that there is so many available choices. I just wish they were a little lower in sodium. I haven’t tried it but looks really good. The taste, I love chili! The convenience of having an awesome tasting food come out of a can! I love the flavor and aroma! I love the taste and the commercials a lot! Had it at my sisters and loved the spicy flavor. I like the price and the taste. I make a cream cheese dip with it that the kids love. I enjoy that it doesn’t taste “canned”. Sadly it is very close to what I remember of my grandmothers slow cooked chili. Sorry grandma- And you can’t beat the affordable price either.